In 500 years there have been little or no game changing innovations in accountancy since double entry was invented. Maybe the creation of the electronic calculator in the 1960’s is the last time anyone can point to an advancement that excited and terrified accountants in equal measure. Since then the computer and internet have become the norm, evolving into intricate accounting packages, ERP’s, BI (Business Intelligence) tools now stored in some mythical “cloud”. Accountants are at the cusp of technology, can quickly record and scrutinise data, offer management information and help make better decisions to drive growth in the business. In recent years with major advancements in processing power we are closer to having AI machines with the same brain power as humans. With machine learning these “Smart” machines will reduce the need for human labour to complete menial tasks. AI is seen as a major disruptor with its ability to complete repetitive & high-volume tasks, as such this automation will reduce the need for roles such as General Ledger Accountants, Payroll and tax compliance. To re-imagine and radically improve the quality of business and investment decisions. For those accountants with an ability to see the bigger picture, the next 20 years will be critical in adapting and becoming a leader in systems integration and automation. Like the industrial revolution, moving from handmade to an automated production line, it will be the engineers who benefit most. In this context, future accountants need to know their role in this new world. Accountants have to understand customer needs, sales, operations and build/maintain a financial system which can speak to all departments. In Theory having “live” financial information at the tip of our fingers. AI will reduce menial tasks, allowing accountants to focus on supporting decision makers. Clients are already looking at creative ways to custom build App’s for B2B’s (Business to Business) to order goods, automate deliveries, issue invoices, and post journals all without the need for human interaction or back office. Soon we will be able to instantly look at customers’ finances, their ability to repay and credit worthiness before even starting the sales process. The benefits to a business are vast and varied and should be welcomed. As Data Analytics and AI become ever more prevalent in society this ability to have this Real Time information will lead to better decision making. As an accountant it’s part of our professional remit to offer this advisory element. The future shouldn’t be regarded as daunting for accountants but positive and improved. Gone are the days of manual data entry and reconciliation’s but instead accountants focusing more on advisory, financial transformation, operational and strategic improvements. Matthew Roberts is a Senior Consultant in the Accountancy & Finance Division at Lincoln. 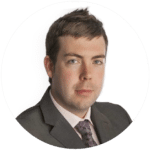 Matthew focuses on the recruitment of professionals from newly qualified accountants to financial managers, building trust and a long-lasting partnership with both candidates and clients.